From 1 November 2012 consumers will know quickly which tyres will help them saving fuel: A new easy-to-read label ranks tyres on a scale from G (bad) to A (best). To make sure that the fuel savings do not come at the expense of safety or noise, three parameters are evaluated: Fuel efficiency, wet grip and external rolling noise. The label is similar to those energy labels already used for washing machines, dishwashers and fridges. The better the tyre (fuel savings, safety and external noise), the better the classification. Red (G) is the worst; Green (A) is the best. Fuel consumption is related to the tyes rolling resistance. By reducing rolling resistance, the tyre has reduced friction and the vehicle consumes less petrol. Wet grip is one of the most important safety characteristics of a tyre. Tyres with very good wet grip have a shorter braking distance when it rains. 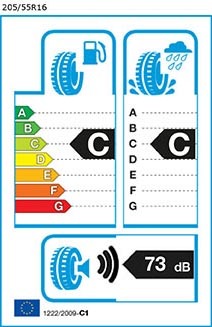 As with fridges, washing machines and other appliances, the label gives the consumer a quick overview of which tyres consume less fuel, are safer in wet conditions and make the least noise. It helps to easily compare tyres and make the correct choice based on the consumers priorities. What does the label NOT cover? washing machine typically uses per year, but does not say anything about specific extra functions a washing machine might have. For example, the indication M&S (mud and snow) is not part of the tyre label, as it should already be marked on the side of a tyre in accordance with international convention. Other parameters such as behaviour in aquaplaning or handling on curves could not be included in the labelling scheme because of the lack of recognised standardised testing methods. How will consumers get to know the label? As from November 1st 2012, manufacturers and importers of tyres have an obligation to supply all tyres produced after July 1st 2012 with stickers, labels and technical material. Distributors (e.g. tyre dealers, repair shops, car retailers) have the obligation to make this information available at the point of sale in a clearly visible position. For all tyres produced before the July 1st 2012, there is no such obligation: This means that for a certain period of time, consumers may find some tyres with labels and others without. The reason for this is to allow producers time to reduce their old stock and prepare for the new label system. How does the labelling scheme work and who supplies the labels? As it is already the case with household appliances, the EU labelling scheme for tyres is based on self-declaration by manufacturers or importers. However, Member States must apply the market surveillance provisions included in the relevant national legislation. They are obliged to survey the market, which includes compliance checks of the various provisions of the tyre labelling regulation. National authorities are also required to check the conformity of the declared classes on the label of tyres (for fuel efficiency, wet grip and rolling noise) and of the measured values. Similar to other products, controls will exclusively be performed by national authorities and not by independent institutions. Are there minimum requirements for tyre parameters? F rated tyres will be phased out as from 1 November 2018. For other parameters – wet grip and eternal noise – other timetables apply. Which tyres fall under the regulation? tyres whose nominal diameter is smaller than 254 mm or bigger than 635 mm. How does the tyre label fit into existing EU policies? As consumers are expected to buy more and more fuel-saving tyres, fuel consumption is to be reduced and consequently less CO2 to be produced. For the EU as a whole, it is estimated that CO 2 savings from all vehicle types are expected to range from 1.5 million tonnes to 4 million tonnes per year in 2020. This is equivalent to removing 0.5 million to 1.3 million passenger cars from EU roads per year. The label is therefore part of the EU strategy for sustainable development. It will contribute to reducing the carbon footprint of road transport, and therefore reaching the goals fixed in terms of sustainable mobility. Who has decided to introduce the label – the European Commission? No. The regulation was adopted by the European Parliament and the EU Council, following a proposal by the Commission. Ahead of this, the labelling scheme was prepared in cooperation with all relevant stakeholders: national authorities, industry, environmental NGOs and consumer organisations. *The information contained in this document was sourced directly from the European Commission and Tyres Assist offer no guarantees that the fuel savings quoted within are 100% accurate or will apply in each application.